In order to make full use of bauxite, we must crush bauxite into small pieces for extraction. So we need bauxite crushing plant. Bauxite crusher is the bauxite mining equipment that is used for crushing. There are several crushers for choose to be bauxite crushing plant. 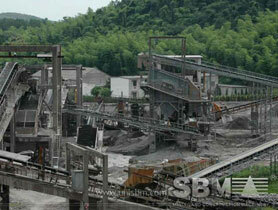 SBM can offer types of crushers: jaw, cone, impact, hammermill and mobile crushers for bauxite crushing plant. We also supply vibrting screen for sieving and classificiation, washer for bauxite washing plant. These bauxite crusher can compose a complete bauxite crushing plant. It is the mainly machine in bauxite processing, and it's capacity can be adjusted. SBM bauxite crushing plant have mainly three kinds. Impact bauxite crusher is optimized and widely applied in the first and secondary crushing. It can crush material which is less than 500mm and anti-pressure strength is below 320Mpa. Cone crusher series has features of reliable construction, high productivity, easy adjustment and low operating cost.Jaw crusher, whose reduction ratio is up to 4-6 and the finished products are even, is the priamry and secondary crusher. "Three years ago, wo changed to use SBM bauxite crushing plant for processing bauxite ores. The plesant experience prove quality of SBM product."